The Parish Council now has its own website where all current information can be found, including the Neighbourhood Plan and current planning applications. This page now contains other Parish matters such as road closures and general parish information. Historical Parish Council Minutes can also be found here. 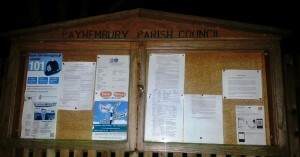 To reach the Parish Council website please click http://www.payhemburyparishcouncil.org.uk/default.aspx. If you think you might be able to help please click bus for details. To read or save these minutes please click November 2017 – Parish Council MInutes. To read or save these minutes please click September 2017 – Parish Council Minutes. To read or save these minutes please click July 2017 – Parish Council Minutes. To read or save these minutes please click Extraordinary Meeting 31 May 2017 – Parish Council Minutes. To read or save a copy of these minutes please click March 2017 – Parish Council Minutes.